An integral part of training our residents to work in inter professional and multidisciplinary teams, this course provides residents with the core pediatric medicine didactic as well as clinic rotation experience. During this course pediatric dental residents engage with medical residents in sharing and learning from each other. 1. To identify and describe the etiology of oral health disparities among pediatric populations and effectively teach pediatricians/pediatricians-in-training about oral health disparities. 2. To identify and describe the causes of pediatric health disparities during early childhood. 3. 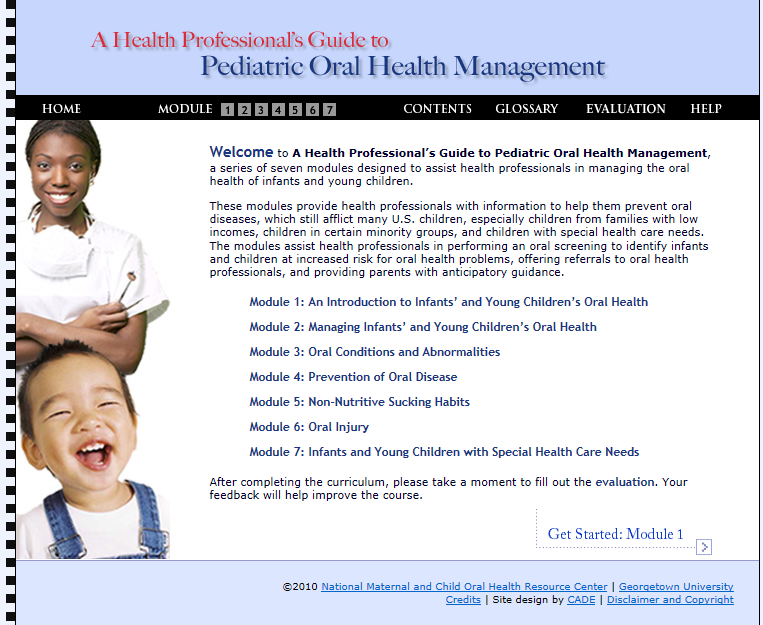 To effectively teach pediatricians/pediatricians-in-training about dental development. 4. To identify and describe at least one milestone of each child development domain at each well-child care visit through age five. 5. To develop the skills to effectively teach pediatricians/pediatricians-in-training the appropriate technique of risk assessment, self-management goals, and anticipatory guidance as recommended by the American Academy of Pediatrics. 6. To describe the expert-recommended guidelines of fluoridated toothpaste and use of tap water. 7. To develop the skills to effectively teach pediatricians/pediatricians-in-training to apply fluoride varnishes in pediatric populations. 8. To describe the expert-recommended guidelines of juice and sweetened beverage intake for pediatric patients. Completing the clinical activity checklist to ensure core set of pediatric clinical competencies are met by each pediatric dental resident. Completing additional reading, handouts, and reviews.